Local crops include corn, beans, coffee, and avocado. Some women make belts, shawls, and skirts with a back strap loom. San Pedro graduates large numbers of teachers who work the Atitlán area. Activities for tourists include hikes to the top of the San Pedro volcano or the Mayan Face, studying Spanish, partying in the restaurant sector down by the lakeshore, volunteering, and learning local crafts. San Pedro La Laguna is a small town with a population of approximately 13,000 people. The inhabitants of San Pedro are primarily Tz'utujil Maya, with a small, but growing, expatriate community. The population is over 90 percent indigenous. The expatriate community that is forming within San Pedro La Laguna is composed of Americans and Europeans. The religion that is the most dominant in San Pedro La Laguna is Roman Catholicism. This has been the most dominant religion since the 16th century, when the Spaniards colonized Guatemala. While Guatemala was under a brutal military regime the North American Protestant Evangelical churches were allowed to enter into any community. As a result of Protestant evangelism, more than 40% of Pedranos are now Evangelical. Even though the Protestant and Catholic religions have been dominant for many years, about half of the population still practices traditional Maya rituals either separately or alongside another religion. Many locals believe the world is inhabited by both good and bad spirits that influence many aspects of daily life. Xocomil, a wind coming from the south that "carries away sin", usually visits Lake Atitlán area around midday. If the wind is coming from the north, the Maya claim, the lake's spirit is getting rid of a person who has drowned after claiming his or her soul. San Pedro La Laguna is in the Sololá department of Guatemala. San Pedro La Laguna is separated into four cantons: Pacucha, Chuacante, Chuasanahi, and Tzanjay. San Pedro La Laguna is located on the southwestern shore of Lago de Atitlán. The town is located beneath Volcan San Pedro. This volcano towers over the lake at 9,905 feet and is an attraction for climbers and hikers. The town of San Pedro La Laguna sits on a plateau and has roads running down either side of a steep ridge towards docks on the lakeshore. The dock on the west side of the plateau is called muelle municipal and has boats arriving from and departing to the town of Panajachel. The east side has a dock named muelle santiago which has boats arriving from and departing to Santiago Atitlan. The east side is also home to la playa (the beach) where people enjoy snorkeling, canoeing, and kayaking. San Pedro La Laguna can be reached by regular boats across Lake Atitlán from Panajachel (45 min) and Santiago Atitlán (30 min), or by direct bus from Guatemala City (4 hrs), Xela (3 hrs), and Mazatenango. 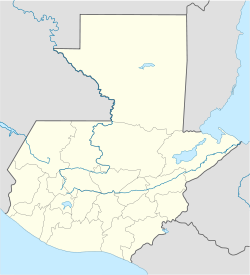 The town is located one hour off the Interamericana Highway (CA-1) at km 148. Buses for San Pedro depart hourly from zone 8, near the Trébol interchange, alongside Calzada Roosvelt in Guatemala City or, in Xela, from the main bus terminal in zone 3. A close view of San Pedro La Laguna. Sunday in the San Pedro La Laguna market with Senior Pedro Gonzalez y Gonzales. San Pedro la Laguna with Volcan San Pedro in the background. Immaculate Conception celebration on December 8 includes lively fireworks. ^ McGraw, John J. "Tz'unun Ya'.com". Tz'unun Ya'.com. John J. McGraw. Retrieved 23 March 2012. ^ Hubbard, Kristen. "San Pedro La Laguna -- Lake Atitlan, Guatemala". About.com. About.com. Retrieved 26 March 2012. ^ McGraw, John J. "Basic Facts". Tz'unun Ya'.com. John J. McGraw. Retrieved 26 March 2012. ^ Morrison, Marion (2005). Guatemala. New York: Children's Press. p. 89. ISBN 0-516-23674-1. ^ Morrison, Marion (2005). Guatemala. New York: Children's Press. pp. 97–98. ISBN 0-516-23674-1. ^ Morrison, Marion (2005). Guatemala. New York: Children's Press. ISBN 0-516-23674-1. ^ Stewart, Lain (2009). The rough Guide to Guatemala (4th ed.). New York: Rough Guides. p. 150. ISBN 978-1-84836-017-4. ^ Greenspan, Eliot. Frommer's Guatemala. 3rd ed. Hoboken: Wiley Publishing, 2011. Print. p.153. Wikimedia Commons has media related to San Pedro La Laguna. Wikivoyage has a travel guide for San Pedro la Laguna. This page was last edited on 5 May 2018, at 06:17 (UTC).